The story behind my brand new Cornholme collection and a new collaboration with British brand Nathan Furniture is featured in this month’s Furniture News magazine. For more information, and to see the full article, click here. 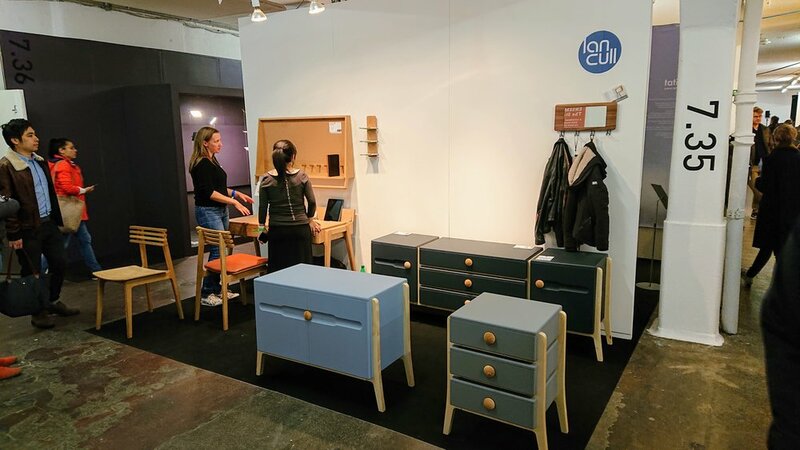 It's over a week since the opening day of London Design Fair 2018, and what a fantastic few days it proved to be! It was great to be surrounded by so many fellow creatives and it felt so good talking to the many people that came to see us to express interest our products. Our Cornholme collection - a desk, wall board and chair - proved to be very popular. The desk packs a great deal of functionality into a compact & stylish package, with generous amounts of storage, extensive cable management, an integrated tablet support and even an option for hidden wireless charging. The wall board incorporates a cork noticeboard, a full-width shelf complete with pegs that can be used to keep books upright and a useful hanging rail with a removable magnetic whiteboard for keeping notes to hand. The chair mixes style with comfort and is available with or without a tan leather upholstered seat pad. Ian Cull with the new Cornholme Collection. Cornholme is available to purchase directly from us, with orders being taken now for delivery in January / February 2019. Be one of the first people to own Cornholme and get a 20% discount on all orders placed before 1st December 2018. Visit the store for more details. Also on show was our new concept 1350 collection... a modular furniture system made up of 450mm and 900mm wide drawers and cabinets. Customers can build their own product, using any of the 4 key cabinet and drawer elements together with a standard selection of legs, rails and dividers. 1350 modular concept alongside Cornholme. 1350 was also very well received, and after some further development it is set to be launched early in 2019. All in all LDF 2018 was a fantastic experience for us and we look forward to showcasing our products again in the very near future. Then I had a thought. A strange one at that. How would I sell myself if I was an estate agent selling a house? I mean, there are lots of properties out there, but usually only one or two fit the bill in terms of what buyers are looking for. So I made myself a flyer. It's a single-page overview of me, describing as far as I can what to expect if you hire me. It differs from estate agent property flyers in one important way - it doesn't stretch the truth (no, that's not a fourth bedroom, it's a living room with a bed in it). Click on the image below to download and print a copy. Contact me to arrange a viewing. Following a mini branding update I thought it'd be a bit of fun to do a quick Q&A feature to give more of an insight into my business and how I work. Feel free to ask me any questions that I haven't included... I promise to be as honest as I can be with my responses! Q. What types of products do you design? A. The short answer is “almost anything”. I began my career designing plastic carrier bags and dispensing systems for supermarkets. I switched to furniture in 2001. Nowadays I’m involved in designing and developing a wide variety of products from flat-pack TV stands to fully assembled occasional furniture. Projects include lamp tables, coffee tables, sideboards, dining tables, bedroom furniture, desks, medical storage units, commercial furniture (seating, desking, storage etc.) bespoke office installations, metamorphic furniture and everything in between! Over recent years I’ve been involved in the development of a couple of consumer electronics products too. Q. What materials feature in your designs? A. I’ve got a great deal of experience working with a number of different materials and manufacturing processes. My designs are usually based around a core selection including solid timber, veneered MDF and plywood. In addition I use glass, steel, aluminium, plastics and fabrics/leather. I’m always keen to learn about new materials and production techniques and I like to use them as and when the opportunity arises. Q. Do you make your own furniture? A. Alas no. At least not at the moment. I trained as a cabinet maker for 3 years on an adult learning course under the expert guidance of Neil Boden at The Manchester College from 2009-2012. The plan was to put these newly honed skills to use straight away, but other events in life intervened. My new studio and workshop should be up and running later this year, so watch this space! I have, however, established very good relationships with a number of manufacturers in the UK and further afield over the last two decades, so I am usually able to source a manufacturer if there is a requirement to do so… even for one-off commissions. Get in touch if you have an idea that you'd like to bring to reality. A couple of my own designs are available to purchase in my store - the Unity coat hook and small shelf. The individual components for both products are manufactured within 40 miles of my studio (with the exception of the fabric on the small shelf which are printed in Newmarket and hand-sewn in Alloa). A. I mainly design for a number of small to medium-sized businesses who are usually directly involved in furniture manufacture. My clients are based in the UK, mainland Europe and the Far East. Q. I’ve never heard of you. What have you designed that I might have seen? A. If you’ve ever visited a supermarket in the UK the chances are that you’ve used a products I was involved in the development of. The Pinch Pull bag dispensing system was originally launched in 1998 and aimed to significantly cut the number of plastic bags used (and wasted). TV stands were my “thing” for many years… so if you’ve ever visited a Currys or John Lewis store in the UK you will have walked past (or possibly looked at, or even purchased!) a product I’ve designed. Probably my most successful TV stand design to date is Riva, designed for UK manufacturer Techlink. More recently I’ve developed a number of successful furniture ranges, including Osby for Blackburn-based Heritage Furniture. Heritage sells products to both independent furniture shops and large high street retailers. Q. OK. I’ve seen that product, but why doesn’t it have your name on it? A. As an independent designer developing products for manufacturers it’s rare that my name ever appears alongside my designs. Much of the work I undertake is covered by a non-disclosure agreement, meaning I work “incognito”. Exceptions to this include work I’ve undertaken for Nathan Furniture, Stil Furniture, Moventi and Bulgarian-based Profoli. A. I love the challenge of developing new designs to a given brief. Quite often this restricts what can and can’t be done either in terms of features and functionality or the materials and manufacturing methods used. I like pushing the boundaries of what is possible and to that end I work closely with my clients and their producers to develop new ideas. I love the variety that comes with working for a number of different clients in a number of different industries. Q. Where can I buy products you've designed? A. Lots of the products I've designed over recent years are available to buy through some of the UK's largest and best known retailers such as Currys, John Lewis, Wayfair, Amazon and The Cotswold Company. Alas many of these products don't bear my name and they are too numerous to list in this blog. My own store contains a small but growing number of products that you can purchase directly from me. Contact me for more information regarding products I've designed for Profoli. A. Hopefully to continue what I’m currently doing and to build on the successful relationships I’ve forged with my current clients, and to develop relationships with new clients of all shapes and sizes. I plan to add to the range of products that are available to purchase in my store. I’ve got some exciting plans for later this year… but for more information on that you’ll have to stay tuned to www.iancull.co.uk/1350/ for updates! It's my first day back in the office after a busy few days at the Manchester Furniture Show where some of my latest designs saw their UK launch with Profoli (www.profoli.com). It's so nice to receive such positive feedback on my work from all parts of the industry, including from fellow designers... it's why I love my job and it makes all the hard work and sleepless nights worthwhile! With interest from retailers, interior designers and specifiers it's great to know that my designs have such a broad appeal. I always strive to offer something a little different, and it's fantastic when this gets noticed by so many people. For more information on these products, or for general information on the services I offer (or even just for a chat!) please get in touch at ian@iancull.co.uk or +44 7803 033350. I've just had a sudden and somewhat sobering thought. Next year, in 2018, it will be 20 years since I graduated from the University of Salford. As I've mentioned in previous blog posts I was incredibly lucky to land a job in the design industry immediately after my three years of studying at Salford came to an end. So it follows that next year I'll have been working as a design professional for 2 decades... I'm not sure if that's properly sunk in yet. I feel like I'm on a never-ending quest; and a very enjoyable one at that. I learn new things every day. I'm always reassessing the way I work and I make changes where I feel they will be of benefit to me and to my clients. I build relationships with new clients, suppliers and manufacturers and I nurture those that I already have. At the end of each day I feel like I know more than I did the day before... and long may it continue! Putting pen (or pencil) to paper and developing new and unique products from a blank sheet of paper is only part of what I do. During my career I have been lucky enough to establish great relationships with manufacturers across the globe. My work as a designer doesn't stop once a concept has been developed and the final presentation has been made to a client. Throughout my work "manufacturability" is at the forefront of my mind. An understanding of the processes, capabilities, restrictions and opportunities involved in manufacturing my designs is key to offering a reliable service, whilst also ensuring uniqueness and differentiation in everything I do. I'm happy to work alongside your existing suppliers, or I can introduce you to new manufacturing partners if required. The factories I work with are familiar with my products, and also with the way I work. In turn, I fully understand their production facilities, processes and capabilities. Together this ensures a positive outcome to every project I undertake. Simply put, I can take your ideas and turn them into finished products with as little fuss as possible. Whatever your design requirement, from one-off prototypes to bespoke single-item production, to serial mass production, I'm here to help. If you'd like to find out more about how we can work together on projects large or small, please get in touch and I'll be happy to have a chat through your requirements. As January draws to a close it seems like a good time to reflect on what has been a very busy month. 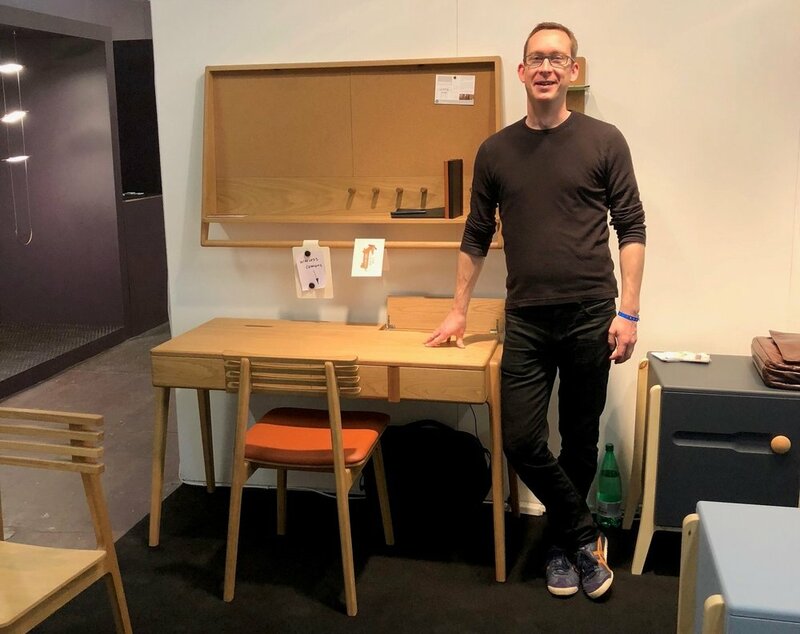 I spent a great few days visiting IMM in Cologne where a number of my latest designs were being launched, including Platta, a small range of occasional tables designed for Profoli. After IMM it was straight back to the UK and to Solihull for the AIS furniture show, where my new Contour collection was launched by Nathan Furniture. Specifically designed as an evolution of Nathan's well established mid-century aesthetic, Contour marks the first addition to the Nathan product range in a number of years. It was very well received by all who saw it and will be available to purchase through Nathan stockists in the next couple of months. February already promises to be another exciting month with a number of new products in development for clients in the UK and beyond. Contact me for any further information on either of these projects. As we approach the end of 2016 I'm looking forward with a great deal of excitement to what 2017 has in store. I've been working away behind the scenes on a couple of projects that are due to be unveiled in January. 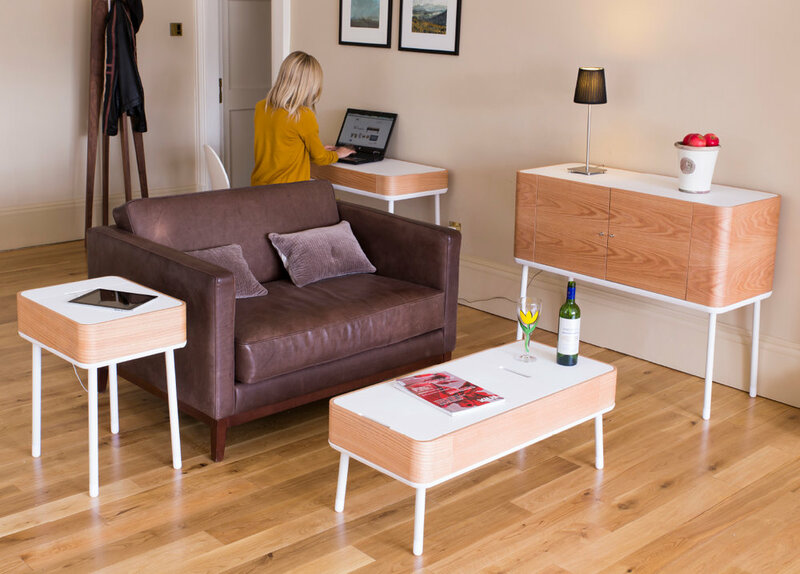 The first of these is a collaboration with British manufacturer Nathan Furniture. 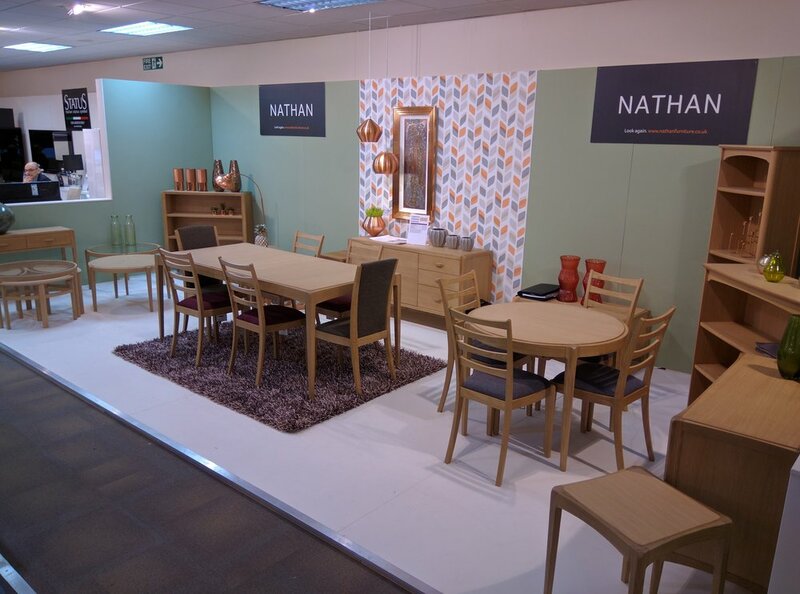 I was approached by Nathan earlier in 2016 to develop a brand new collection for them that followed their signature mid-century style but offered a more contemporary product to consumers. The results of this collaboration are set to be unveiled at the AIS Furniture Show, 20-23 January 2017 at Cranmore Park Exhibition Centre, Solihull, UK. I was incredibly lucky to land my first design job immediately after graduating from the University of Salford in 1998 with a BSc in Product Design and Development. I began my career as a design researcher working for a large packaging company based in Birmingham, UK. As part of a small team of young designers I was instantly immersed into a fast-paced, high-pressure environment developing innovative products for the UK's top supermarkets. One such product was Pinch Pull, a product developed to address both the needs of supermarkets and consumers alike. Pinch Pull was a revolutionary system that aimed to solve the age-old problem of difficult to open plastic bags, whilst also helping supermarkets cut down on the number of bags used throughout the store. Replacing the traditional "bag on a roll", Pinch Pull is a cartridge-based system that enabled supermarket customers to remove bags one at a time with ease, with the bag being dispensed already open. The system was soon developed further to accommodate large carrier bags at the checkout. It's rare to be involved with the development of a product that is so widespread and familiar to so many people. Although the product is almost 20 years old, and despite the introduction of charges for plastic carrier bags in the UK, Pinch Pull can still be seen today in a number of supermarkets. I'm proud to have been so heavily involved in its development. The experience I gained during the development of Pinch Pull forms the foundation of my career as a designer. An immersion into the wider world of design within a manufacturing environment so soon after graduating from university has proved invaluable to me. Everything I learned during my time at Euro Packaging has stayed with me and I continue to build on those experiences each and every day. This month's edition of Furniture News includes an interview I gave to Rob Scarlett. There's an insight into how my career began and I've given my views on how design is perceived in the industry. Click on the image below for the full article. After a busy week it was nice to visit a very satisfied client and see how a new collection of products I designed has turned out. To say the client was exstatic is an understatement. Looking forward to seeing them launched into store in the new year. My brand identity has had a little bit of a mini makeover recently in order to reflect the wider scope of the projects I'm involved with. 'Furniture and Accessory Design' has become 'Lifestyle Product Design' as this more accurately reflects the work I undertake. Over recent months I've been working on a number of projects that have steered me in a direction away from pure furniture design, including some exciting electronics-based products and some medium and large-scale interior design projects. As ever with much of my work I'm unable to publish the details of individual projects until they enter the public domain. As and when this happens I will post updates in my blog. Whatever your design requirement, please get in touch and I'll be happy to chat through how we can work together. I'm really pleased to announce that Designboom have chosen my Unity fabric shelves to appear in their online shop. Unity is a new and exciting range of products designed and manufactured by Ian Cull. Each product in the range brings a new level of style and usefulness to everyday storage solutions. More products are set to be added to the range over the coming weeks and months. All Unity products are proudly manufactured in the UK and are available to purchase directly from the store. We are currently seeking retail partners for Unity and trade prices are available. Please contact us for further details or if you would like to stock our products. It was great to see some of my latest designs on show at InteriorsUK at the NEC in Birmingham earlier today. 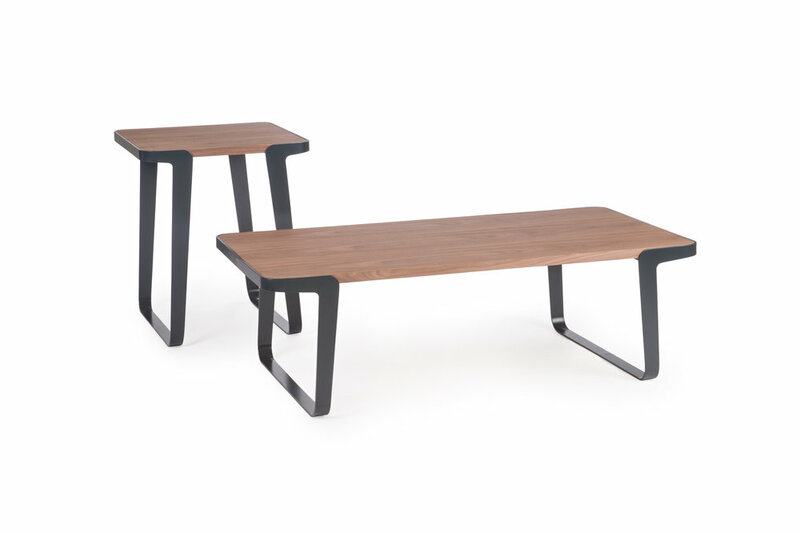 These form part of the new 2014 collection for Stil Furniture. Having stumbled across a fantastic augmented reality app, I've begun to experiment with "virtual" furniture. Being able to visualise an item in the environment in which it will be used is a powerful tool for anyone from designer to end-user. How does it work? A 3D computer model is generated of the product (this can be either a concept or an existing product). This model is then uploaded to the software & shared. Anyone with the free augmented reality app can then view the model for a limited period of time. Simply placing an A4 tracker (a plain piece of A4 paper printed with a special pattern) on the floor or on a wall acts as an anchor for the virtual item, and ensures it is shown at the correct size & scale. Below is a very basic video showing the app in use, comparing a virtual version of my Dale lounge chair with the real thing. I'll post more over the coming days as I experiment more. For more information and to see how this software can benefit you, please contact me to discuss things further.